Bitcoin Triple Trouble, Unstoppable Rise, $5000, $10,000 and What’s Next? Bitcoin rocketed new record high at $4,800 and there appears to be no stopping it right now. Unprecedented growth of almost 800 percent in the space of just a year, exceptionally long bull market. It would be no surprise to anyone if it hits $10,000 very soon. Bitcoins volume are soaring in almost every nation-state, and Bitcoin fewer making people feel that they are missing the boat on this enormous opportunity stricken currency, feeling jealousy about early adopters who made money out of it. As a result the Bitcoin network grows and real dollars are invested every moment in it from large, or group investors and “whales” to an institutional investors to small investors and individuals, so now the market capitalization has reach $170 Bln and of this according to CoinMarketCap Bitcoin has a marked value of about $78 Bln, on which the same investors are betting. 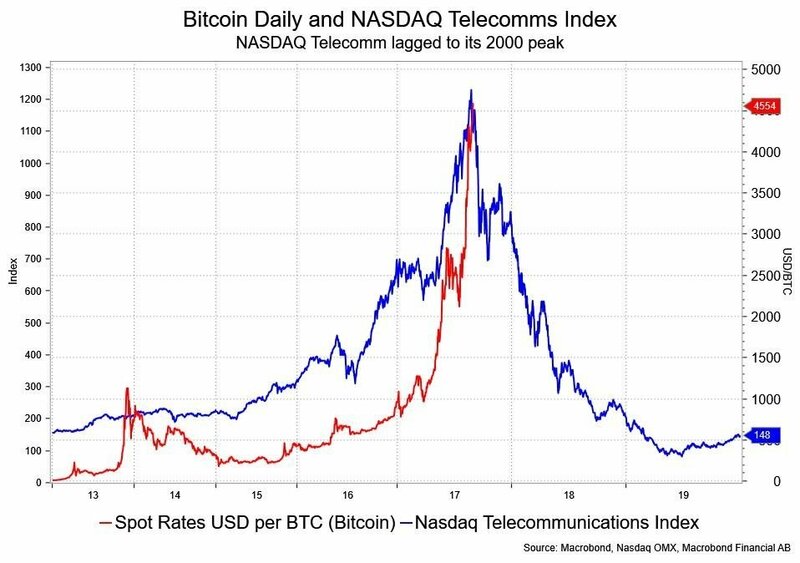 First trouble- All these happenings look very similar to the tech bubble as commented by David Ader, chief macro strategist at Informal Financial Intelligence, shows that Bitcoin gains resemble that of NASDAQ Telecommunications Index before the tech bubble burst. To prove his conclusion he even matched a graph of the Nasdaq Telecommunications index at its peak in 2000 to Bitcoins five year run to all time high, I think its going to come to a sorry ending. The psychology of bubbles fuels it. The higher the price goes up the more convinced you become that you are right. Second trouble- These huge gains and rapid climbing in price and value of Bitcoin is very good for holders of Bitcoin as an investment asset and great for speculators, but it is very, very little useful as an actual daily currency with which you can buy and sell almost anything. In contrary Bitcoins eye-popping rally in climbing in value severely limits its usefulness, and it become a distraction and even an obstacle in negotiating transactions on daily basis. It creates an incentive to hoard and to keep Bitcoins not to spend. In traditional states and traditional currency terms we call it a negative inflation, ie. a deflation, as such in a traditional country’s economy it would result in a very damaging almost devastating implications and in a stagnant economy. Third trouble- Bitcoin is going again into the so called “FORK” in which a new upgraded version of the blockchain will be launched, and what? We might have another split and as soon as this fall, resulting in a new currency born overnight, BitcoinX. With Bitcoin original having in circulation 16,5 Mil coins, Bitcoin Cash also 16,5Mil coins, guess what? Bitcoin X will have 16,5 Mil coins same!? So there is a fear of Bitcoins infamous extra volatility and speculative pressure. But devil is not so black as is told, and Bitcoin still facing many challenges becoming a globally accepted currency, still there are many experts, well respected names on Wall Street have issued positive reports and are optimistic about Bitcoin and other cryptocurrencies future. The World Economic Forum predicts that 10 percent of the worlds GDP will be stored with blockchain technology in 10 years time representing whopping $7,8 Trillion value in today price. In early July Thomas Lee, major Wall Street strategist said Bitcoin could reach $20,000 to $55,000 by 2022. Stock analyst Ronnie Moas of Standard Point Research published a report in late July predicting Bitcoin would rise to $5,000 and then corrected that target to $7,500. Lee and Moas both reason that Bitcoin can climb to those levels if even a fraction of the trillions of dollars in gold and other traditional investments move into Digital Currency. Chris Burniske, author of upcoming book “Cryptoassets: The innovative investors guide to Bitcoin and beyond” As digital currency overall worth in this moment is about $170Bln that makes the value of all digital currencies less than 5 percent of the more than 4 Trillion inflation adjusted value of stocks. If people think this is a big bubble , than they don’t have an appreciation for how big the idea of Cryptoassets really is. Just like in the dot.com bubble, companies that were able to utilize underlying technology then became global giants, and this will happen again and we hope and believe that aiming those giants will be also Bitcoin. Is Bitcoin Going To Have A Sorry Ending?